After a weather delay and several cautionary holds, the New Shepard rocket was cleared for launch Sunday morning. 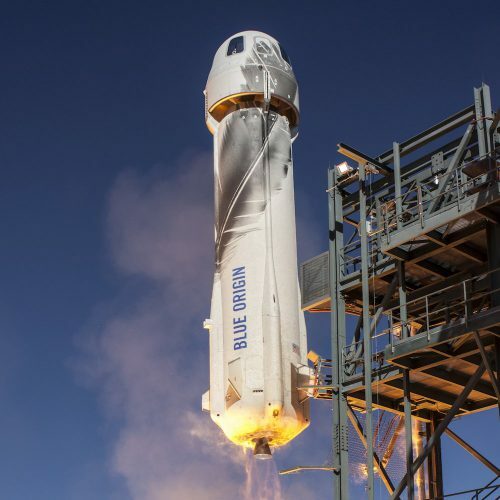 On this flight, Blue Origin was testing the rocket’s system, looking to launch it higher than they had before. Traveling at speeds that reached up to 2,2000 mph, the rocket reached a peak altitude of about 351,000 ft. — which is well above the Karman Line, the boundary between Earth’s atmosphere and space. Blue Origin says after this mission the company is one step closer to flying humans into outer space. You can rewatch a replay of the flight below. This entry was posted in KRTS News, KXWT News and tagged Blue Origin, Mission 8, Space tourism, West Texas. Bookmark the permalink.